Think for a moment about Montana…what images come to mind? As we prepared for our trip to Southwest Montana, I found myself dreaming of wide open spaces and a touch of the wild west. Our first excursion for our trip certainly supported those dreams, and gave us the perfect welcome to Big Sky Montana. This recap is part of my coverage for Southwest Montana Tourism, and I was provided compensation. As always, all thoughts and opinions are my own based on our experience. We booked our family for the Last Chance Ranch Wagon Ride Dinner, which is based out of Helena, Montana. Following the directions we received, we headed out to meet up with the bus that would take us to the wagons to begin our journey. We met up in a parking lot with a few other folks who were booked for the dinner, and found that our transportation would be a school bus for the evening. Definitely made me feel like I was heading out for a field trip! The bus took us on quite a ride away from the historic city center of Helena. It was a beautiful drive, although towards the end we all started to wonder just how skilled our driver would need to be to maneuver that large bus along what was deemed a road. But, we arrived without incident to a nice little ranch and parked alongside three wagons that were hitched up with a team of draft horses. We piled out of our yellow chariot and were assigned to wagons, our wagon was filling up fast so our driver told the girls they’d get to ride up front with him. This was a HUGE hit for the girls, they felt excited and quite special at getting to ride with the driver. Our driver was Bruce Anfinson, the owner of the Last Chance Ranch, and the main voice and leader for the wagon ride dinners. He’s got a fabulous personality, brimming with joy and cheer. You can tell he really loves what he does, as well as being a perfect character to fit in those wild west Montana visions you might have. As we rode in our wagons, we had a chance to chat with some of our fellow passengers. We were on the first wagon ride dinner for the season and it was definitely full. We found out that our group included a large group of RV travelers who travel together, so it was fun learning a bit about where they were from. Our girls were the only kids on the trip, which was a bit surprising. Last Chance Ranch Dinner House – time to grab some grub! Once we reached the end of our wagon ride we arrived at a large hand built log cabin for dinner. Along the way we passed an old tepee frame which was where Bruce used to host the dinners, but due to age and growth, he build the new cabin for the experience. Our dinner was served family style along beautiful long picnic tables and chairs, with our names being left at each seating. Since we were a large group the seating was a bit tight. Dinner was delicious! It started with an individual salad course, then we had the family style meal of prime rib, “Grizzly Gulch” succotash (the best I’ve ever tasted and I’m going to get the recipe! ), and potatoes. The food was so good that I only remembered to snap photos of the salad, those succotash vegetables stole the show for me! You could choose how you wanted your prime rib cooked, perfect for those who want it rarer or more well done. Then it was time for dessert…oh my. Fresh huckleberry cheesecake served with classic cowboy coffee, yum, yum, yum! As we enjoyed our salad course, Bruce introduced the staff and sang us some cowboy tunes with his guitar. I want to mention as an allergy family, no nuts or eggs, the staff at the Last Chance were awesome at working with us to make sure Mia could eat each course. They provided her a special salad with no eggs, had her skip the bread in case of nut allergens, and made her a very special, one of a kind dessert featuring whipped cream in a mug topped with huckleberries. As a traveling allergy family, this was very nice and really meant a lot how kind the servers and staff were at helping us. A big kudos and thanks to the Last Chance Ranch dinner staff for helping our allergy kiddo enjoy a safe and tasty dinner! After dinner there was a bit of downtime, and most people took the opportunity to head outdoors. There are some beautiful bar stools surrounding the cabin that were hand built by Bruce, so it’s a great place to sit and sip your tea or cowboy coffee. The girls were getting a little antsy so this was a good time for them to stretch their legs and run around a bit. Soon everyone had finished with their meal, so Bruce gathered us again on the cabin decking and started in on some fun cowboy tunes. We slowly all gathered around and smiled along as he sang some classics, as well as leading us in some audience participation rounds too. With the moon high above, it was time for us all to head back in our wagons for the return bus ride to town. I can say again that my girls were the only kids present, and I think that’s odd as this is a fabulous family activity. While there is a bit of downtime during the dinner time, the open space outside the cabin is perfect for little ones to explore. My girls even picked some wildflowers for me! I would definitely recommend this for families heading to the southwest Montana region. The Wagon Ride Dinners cost $85 for adults, $70 for children (10 and under). You can contact the Last Chance Ranch for more information (Call for reservations or more information. 406-442-2884). This was just one of our fabulous experiences during our trip to Southwest Montana. Check out the full list of our adventures in my Southwest Montana one week itinerary post. 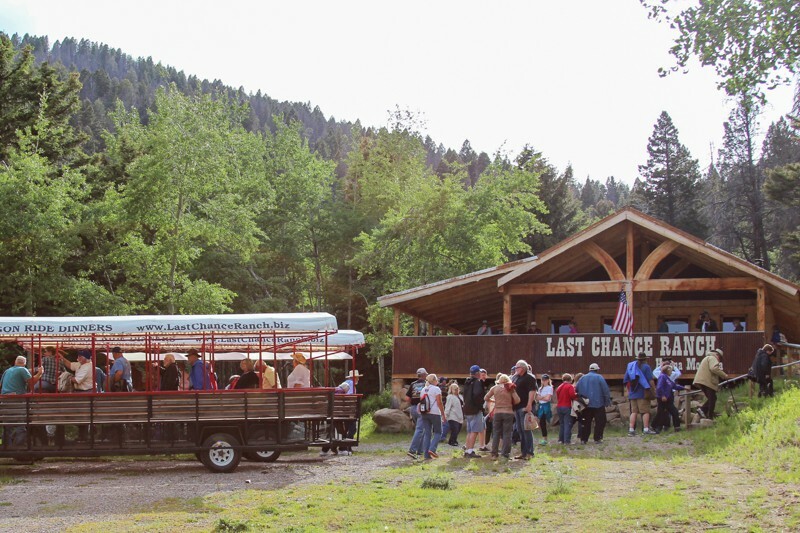 Last Chance Ranch Wagon Ride Dinner is the perfect experience to add to your Helena Montana travel plans! that sounds like such a fun experience!! It makes me excited for our upcoming trip to Montana! Hope you have a great time in Montana, Tamara! What fun! I’d love to visit Montana, it just looks so beautiful and this sounds like a really fun experience for the family. Thanks for the recommendation! Thanks for commenting Katja. It is such a beautiful part of the country, and we had a lot of memorable experiences! That sounds like a lot of fun! We enjoyed a Chuck Wagon dinner in Colorado when I was a kid. I’m sure they didn’t serve prime rib, though. That’s a rich-living cowboy! The cost does sound high for a family event, though. Hi Beth, yes it was pretty deluxe! The price might be a bit high for families, but it is a great experience!